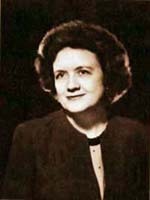 Elizabeth Dilling was a widely known critic of Judaism prior World War II until her death in 1967. In writing Jewish Religion, Ms. Dilling chose her research materials with care. Her primary source, the Soncino Talmud, was produced by the finest scholars of Judaism. The Rodkinson Talmud was a monumental work endorsed by Rabbi I. M. Wise, a pioneer of Reform Judaism. Rabbi Dr. Louis Finkelstein, author of The Pharisees: The Sociological Background of Their Faith, became president of the Jewish Theological Seminary of America shortly after his book was published, where he was remained for more than 30 years. Thus, Ms. Dilling's research spanned the best that Conservative, Orthodox, and Reform Judaism had to offer in the English language. She also drew from the 12-volume Jewish Encyclopedia, which, though a century old, still stands as a monument to Jewish mainstream scholarship; the 10-volume Universal Jewish Encyclopedia from the early 1940's; US Government State Department Records, The American Hebrew periodical, and other publications. Come and Hear™ is proud to present the full text of The Jewish Religion: Its Influence Today, here, on line. In this book, Elizabeth Dilling presents a Christian's critique of the Talmud as it interprets Biblical teachings. The printed book contains hundreds of photocopied exhibits and references into the Soncino Babylonian Talmud and the King James Bible, encyclopedias, State Department papers, periodicals, the Soncino Talmud, and rabbinical writings. We have used the second edition of this scholarly 1963 classic, with scanned images of all her exhibits and hotlinks into the source text of each, wherever they could be located.